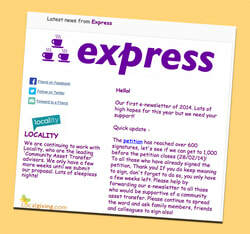 Express is registered so simply select us as your cause, let us know so we can help promote & Good Luck! 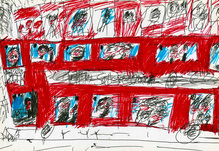 A drawing by one of our young people to express how he feels at school sometimes. ​We are a 'not for profit' community organisation based in the borough of Kingston upon Thames. 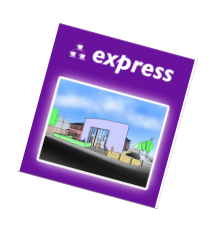 express has been our vision for a number of years and was formalised in Spring 2012 and registered as a Community Interest Company in September 2012. We have progressed rapidly and now have offices in Tolworth running lots of different services but we still have lots to do until we serve our first express coffee from our ultimate goal, a purpose built autism hub in the heart of the community, a place for everyone. Visit our events page for all the latest information on what's coming up at express and for booking details. ​So excited to have Dean Beadle talk for us again. It’s always such a pleasure. Your evening will be hosted by our wonderful patron Mr John Williams (My Son's Not Rainman)! Dean will share what he has learned about himself in the 20 years since he discovered he was autistic. He will cover: school life, anxiety, autistic joy, sensory needs, emotional needs and much more. This humorous and insightful evening will include songs that have been relevant to Dean's life, sung by Dean and accompanied by John Pead. Tickets include light nibbles and there will be a cash bar on the evening. Fantastic news! Express CIC has been chosen for the next round of the Co-op Local Community Fund. You are now able to choose us as your project to support. Our newsletter for Mar has just been published. You can view a copy online here. To ensure you don't miss out on future issues, send us your email address below. We assure you we won't pass on your details to anyone else. ﻿﻿In 2014 Kingston Council voted unanimously to support our proposal to pursue a 'community asset transfer' to take ownership of the site of the former Fairmead Day Nursery for our community hub. Thank you to all those who attended the public gallery to support us - much appreciated! Keep spreading the word to make people more aware of the work we do and our vision for the hub. You can view a copy of our leaflet here. Our first step is to evidence need so please if you have not already done so complete our short survey as soon as possible, and spread the word! Listen to our audioboos for KVAs Impact Aloud programme now uploaded :) You can listen here.